Gingerbread Cookie Bars are a fabulous way to say ‘I love you’ not just during the holidays, but anytime of the year! 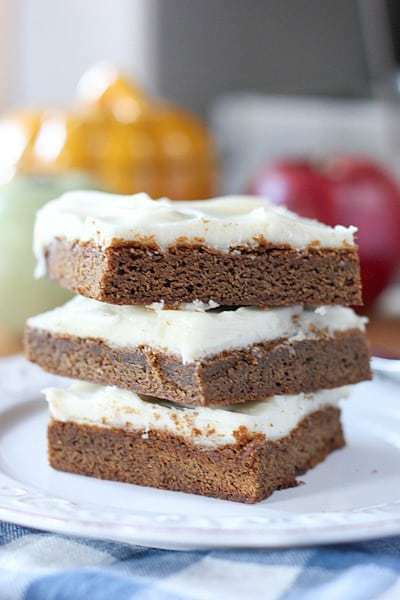 Gingerbread Cookie Bars- Stacked High- Yum! It’s a bar, it’s a cookie, it’s a bar, it’s a cookie! Who cares what it is…it’s yummy! It’s Gingerbread Cookie Bars! All the flavors of a gingerbread cookie in the convenience of a bar cookie! Okay, my ‘bars’ look more like pieces of cake. I have “portion issues”. You could go smaller if you were so inclined. Smaller bars would probably yield about 24 cookies or a half inch off your waist. These are not diet bars…repeat, not diet bars! 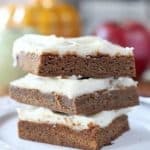 They are sweet and gooey and just what a serious dessert lover ordered, I can’t get enough of these Gingerbread Cookie Bars! Super easy to make, with everyday ingredients. You can sub all the spices for 1 tablespoon of pumpkin pie spice, if thats easier for ya, and I have also heard rumors that ‘some people’ BUY their cream cheese frosting rather than make it from scratch…say it isn’t so! These would be great for a bake sale or to bribe your hubs into hanging up those holiday lights! If you need more cookies (and who doesn’t?). Check these two out…they are my faves for the holiday and of course….easy! 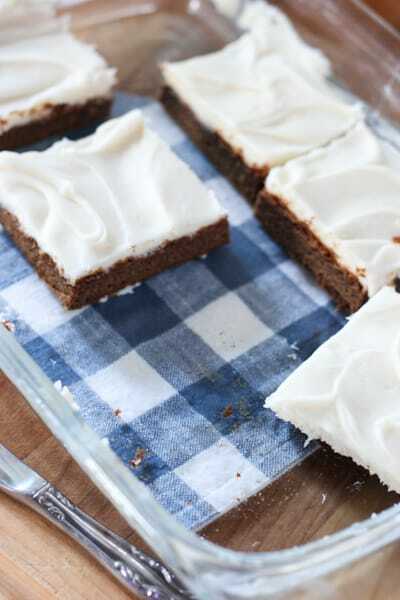 Easy to make Gingerbread Bars that feed a crowd! These are great for bake sales or parties or just your family who loves dessert! Grease a 9×13″ baking pan and set aside. In a large bowl, cream butter, sugar, brown sugar, vanilla, and molasses. Add egg and stir until completely incorporated. Add baking soda, flour, cinnamon, ginger, cloves, nutmeg and salt and mix until well combined. Press dough evenly into the bottom of greased pan. Bake at 350 degrees F for 15-20 minutes and let cool. Cream butter and cream cheese together in a large mixing bowl. Add powdered sugar and vanilla and beat until smooth and cream. Frost the bars and serve! I garnish the tops of mine with a little nutmeg. We introduced these Gingerbread Cookie Bars on Episode 56 of our baking podcast, Preheated. Next week we’ll review them in Episode 57! Can’t wait! Okay, stop reading now–pull the flour and grab your mixer! These cookie bars are chewy, spiced heaven! This recipe will definitely be on repeat in my home at the first sign of Autumn through Christmas! I gave my mom the recipe for a Christmas party she was having, and she told me people were calling her for the recipe. These should be called “Vanishing Gingerbread Cookie Bars”! Absolute YUM! I am so glad you like them! I really want you to try the chocolate cake with chocolate ganache! A sprinkle of salt and a glass of JM Longevity and everything is fabbbuuulllousss! Love your notes…keep them coming! I can’t wait to try it! Sounds like it would be perfect for Valentine’s Day–or any day for that matter! 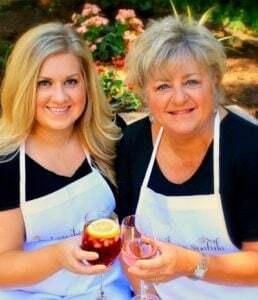 I know I can go for chocolate cake and wine any day of the year!! I absolutely LOVE ginger cookies! 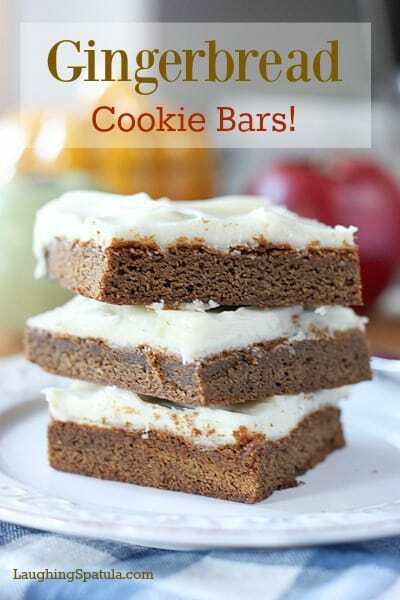 These cookie bars with cream cheese frosting look so scrumptious! I am making a batch today for a party this weekend…they are addicting! Thanks for your note! I love the excuse to have a much bigger piece during this time of year and call it a bar. Thanks for that tip! These look so scrumptious, and I bet they smell amazing while they are baking. Can hardly wait to try them. Thanks for sharing. I love the simplicity and all the wonderful fall flavours of this recipe. Thanks Lia – hope you get a chance too! Yum! I am so gonna make these sundy on family advent baking the third (although it´s only the second advent, but…baking! Yes please! I love these, they look so perfect and chewy! Hello Annie! I was just on your blog….always love your stuff! Thanks for the note and Happy Holidays!